Most of us know what is a mission and vision, yet struggle to articulate one. 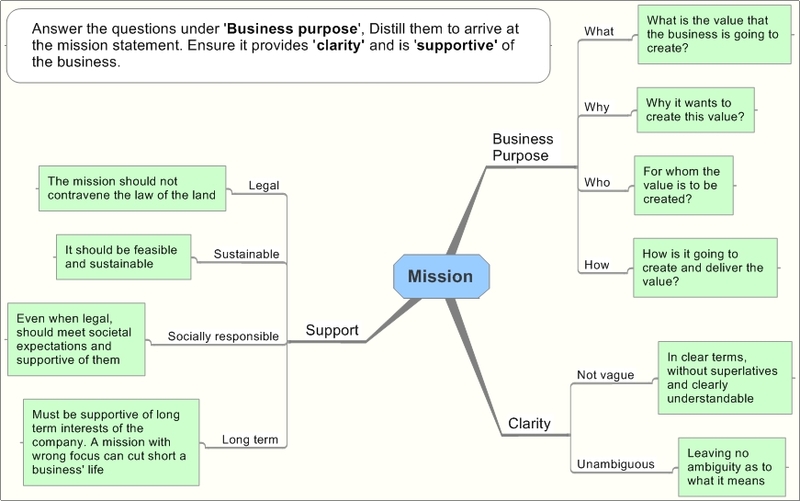 To assist my client, a year ago, in setting corporate mission and vision statements, I drew a diagram using a mind map software. Posting them here as it could be of help to people looking for 'how to prepare Mission & Vision statements'. Also I can learn from their feedback. If you have any queries or like to discuss on these post them under comments. Excellent mindmap - simplifies the concept immensely! Liked all your other mindmaps too! Thank you sir for your appreciation. I use mindmaps to think and present thoughts. I have been using them for quite sometime. As you put it, it helps them to simplify a concept. Thanks to articles I have read here, beginning to understand better what I'm doing. Or supposed to be doing. Thank you. Nice to hear Prashant. Wishing you good luck.